The New York Times reports that for the first time in 44 years, Rolling Stone editors will let readers vote online for the rock band that will grace the cover of the legendary magazine. In a collaboration with Atlantic Records and AOLMusic.com, sixteen unsigned rock bands will compete for an Atlantic Records recording contract and the honor of being featured on an upcoming Rolling Stone magazine cover. This competition is part of a campaign sponsored by Garnier Fructis, a L’Oreal hair products brand for a unisex market. Rolling Stone has already chosen sixteen “undiscovered” bands which will first compete for online votes, then live at the Bonnaroo Music and Arts Festival in June, with the winners selected in August. The competition was officially announced on the Valentine’s Day episode of “Late Night with Jimmy Fallon,” which is where the winning band will be announced and perform in August. Online voting began immediately after the announcement both on the Rolling Stone Web site and on AOLMusic.com. In March, the four most popular bands along with the four bands chosen by the magazine’s editors will head to New York to start working with multiplatinum-selling producers and record two tracks at Atlantic Records studios. Soon after, voters will reduce those eight bands to four, then down to two finalists. Those final two rock bands will perform at Bonnaroo, with videos of their songs posted online to help readers pick the winner. The sponsor of the competition, Garnier Fructis, is regularly involved in music events with unisex appeal since men make up from 40 to 75 percent of the brand’s purchasers. This is the company’s fifth year as a sponsor of Bonnaroo, where they set up temporary salons to give free shampoos to festival-goers. Last summer, the brand lathered up more than 6,000 Bonnaroo attendees and also stocked the festival showers. “Garnier Fructis has a platform of authentic voices, and music has always been a core equity of the brand,” said Deborah Marquardt, vice president for media and integrated marketing at Garnier. 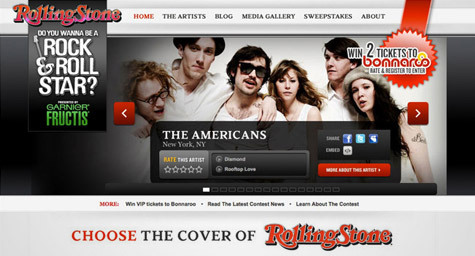 As part of the campaign, the brand will be prominently featured on the competition section of Rollingstone.com. On another section of the site that will go live on April 1, the Garnier Fructis Green Room will show behind-the-scenes videos, including stylists coiffing musicians. As the competition narrows, the brand may closely cater its messaging to the competition by selecting print and online ads to promote the products appropriate for the finalists’ hair types. By combining the popular elements of rock bands, a legendary music magazine and the phenomenon of interactive voting, Garnier Fructis is appealing directly to its demographic of music-lovers who want to be heard regarding what they like to hear. MDG Advertising, a full-service Florida advertising agency, with offices in Boca Raton and New York, NY, specializes in developing targeted Internet marketing solutions, exceptional creative executions and solid branding and media buying strategies that give clients a competitive advantage. Our core capabilities include print advertising, branding, logo design , creative, digital marketing, media planning and buying, TV and radio, public relations, Web design and development, email marketing, social media marketing and SEO. To view MDG’s portfolio, click here.